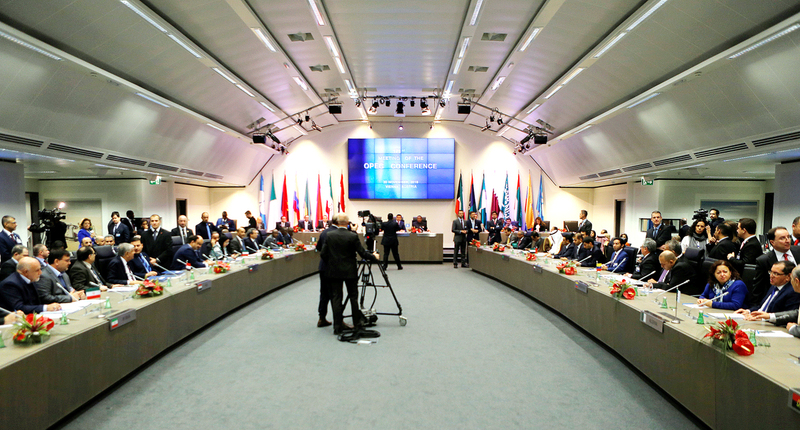 A general view of the beginning of a meeting of the Organization of the Petroleum Exporting Countries (OPEC) in Vienna, Austria. It is increasingly apparent that Russian President Vladimir Putin’s good offices were critical in reaching the OPEC agreement to cut back oil production. The new agreement to freeze crude oil production has seen regular headlines appearing about the rapidly growing influence of Russia, and its ability to manage complex international processes. The Western media have credited Vladimir Putin with the fact that oil prices have again started to rise – and this is one time when they are being truthful. Looking for a “Russian link” or “Putin’s hand” in significant events has now become a tradition with Western media. This has led to a comic saying circulating in Russia; “if a cat abandons her kittens – it’s Putin’s fault;” but Western readers have not tired of hearing of the looming shadow of Russia behind every event. Refugees are pouring into Europe -- because the Russians have forced them to leave their homes; Britons voted for Brexit – because Putin influenced them. Trump won the election in America – because Russian hackers changed the election results. Now, according to Reuters, an OPEC agreement to reduce oil production, which has led to a significant increase in prices – by 9% (from $46 to $54) per barrel of Brent, was made possible because of Putin’s personal intervention. According to the news agency, the Russian President held talks on this issue with Saudi Prince Mohammad bin Salman in September and, on the eve of the agreement, talked with his Iranian counterpart, Hassan Rouhani. Reuters refers to “sources”, although the meeting with bin Salman and talks with Rouhani were never secret. VZGLYAD online newspaper reported on both these events and, both times, it was emphasized that oil was the main topic of the talks. The news agency Bloomberg also reported on the eve of signing of the agreement that a detailed phone conversation was held between the head of the Russian Ministry of Energy Alexander Novak and his Saudi counterpart, Khalid al-Falih. They talked at 2 a.m. in the morning, and Novak had assured that Russia would not only freeze production, but also reduce it by 300,000 barrels per day. Another interesting detail – according to Bloomberg, Novak, al-Falih and their counterparts from Venezuela and other OPEC countries discussed the outlines of this agreement on the WhatsApp messenger. While the claims of direct Russian influence on the American elections, or the centrifugal tendencies in the European Union are laughable, there is good reason to believe that, in this case, those involved would not have succeeded in reaching this compromise without Putin’s involvement. Despite the fact that oil is produced and sold by tough men, the oil market is extremely volatile and delicate, easily affected by careless words. When Russian officials, until recently, claimed that despite the shale revolution, oil prices would not collapse, they were accused of having poor acumen. However, it was not a question of quality acumen, but the declarations of confidence that helped prices remain at a high level for some time. The actual level of production affects the price of oil, but it is much more influenced by statements of market participants and analysts, political events, the weather, and other intangible factors. No one is really aware how much oil is extracted in the world. All figures are quite approximate. The Wall Street Journal published an article in March, which stated that, according to the International Energy Agency, 800,000 barrels of oil were “lost” in 2015. According to the IEA, on average, globally, 1.9 million surplus (unneeded) barrels of oil are extracted every day. Of this, 770,000 barrels went into oil storage tanks on land, and around 300,000 were in transit at sea or in pipelines. The rest, over 800,000 barrels of oil per day, remain unaccounted for. During the year, this amounted to half a billion “lost” barrels. “The most likely explanation for most of these missing barrels is that they simply never existed,” noted Paul Horsnell, from Standard Chartered. Now Russia and OPEC have agreed to work together to reduce production by 1.8 million barrels a day. The key issue now is not by how much production will be reduced in reality, but whether the market is convinced that oil supply will actually reduce. This is where the political factor comes into play. Oil producing countries are very reluctant to reduce extraction, for a number of obvious reasons. These include losses from investments in exploration and construction of infrastructure, and the fear that “if somewhere something is lost, then somewhere, something must necessarily be gained”. Saudi Arabia believes that if it reduces its own supply, then its main enemy – Shiite Iran – will immediately step into the void. Iran feels it has the right to the benefits of increased production, because it was most affected by Western sanctions. Iraq does not control a significant portion of its own deposits. And finding itself in a severe crisis, Venezuela is selling as much oil as it can – as the only way that it can avoid mass starvation. To reach a compromise, a figure of authority was required, one who would keep his word and have a sufficient degree of influence on others. Vladimir Putin assumed this role. Respect for Russia has increased considerably in the Middle East since the beginning of military operations against the Islamic State in Syria. This is despite the fact that the vast majority of Arab countries are permanent enemies of Syrian President Bashar al-Assad. Saudi Arabia and Iran do not trust each other, but they willingly trust Russia, and believe that Moscow has the ability to persuade third countries to adhere to undertaken commitments, and not try to replace them in the market. This was the critical factor that made the agreement possible. When someone asks the question – “Why should Russia be fighting in Syria? Don’t we have enough of our own internal problems? It is worth remembering that this is the very reason. The growth of the country’s prestige in the international arena is not just an ephemeral concept. This authority can be converted into agreements, and agreements are money. However, high oil prices do not benefit everyone. So immediately after the agreement was reached, information started being circulated that “there is no certainty that this reduction is real”, “the production would have decreased anyway.” “All of this is already reflected in current prices”, “there will be no deficit”, and so on. As a result, there was a slight correction in the market. The Brent price decreased from $54.40 per barrel to $53.20, and then began to rise again. In the coming days, the price of the black gold is likely to be quite volatile, going up and down. Reasons for a new sharp fall are not yet in sight.